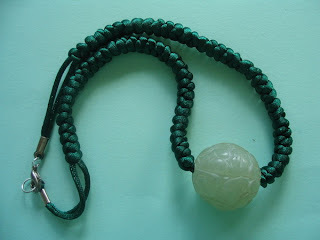 This emerald-green satin cord of snake knots sits well with my large pale green spherical jade bead. I used this piece as practice for making snake-knots and it looks not too bad ? Hehehe! Self applause and loud clapping ! As a l-i-m (learn-it-myself) crafter I must admit that my project was not all smooth sailing and I did encounter obstacles. First of all my cord dimensions although taken from a pattern in a book, ended on the short side. It may be due to typo error or it might have been due to the loose tension in forming the knots. Although the snake knot is one of the easiest of the Chinese knots, the tension still took a while to get the hang of. I had to unpick and start over many times. Oooo ! what a pain in the neck that was ! With chinese knots the mantra is not only "practice, practice, practice !!" but also "patience, patience, patience" It is also dash difficult to get the snake knots to lie flat, they keep on undulating like a typical snake ! Back to my bead .. like all things Chinese this necklace has many auspicous meanings. 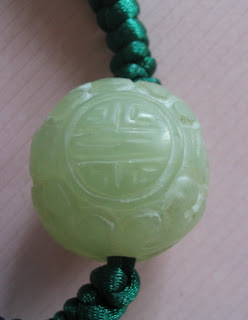 The large bead is carved with the Chinese character "Shou" for longevity, while the snake represents - rebirth renewal and healing. It is also regarded as a source of good luck as well as guardian of treasures. Here are 5 more similar looking beads in various sizes.